Different from most english muffins today, these are made from freshly sprouted live grains and contain absolutely no flour. We believe in sprouting the grains we use in our english muffins because sprouting is the best way to release all of the vital nutrients stored in whole grains. To unlock this dormant food energy, maximize nutrition and flavor, we add just the right amount of water to healthy whole organically grown grains which are already bursting with nutrients. Beneficial enzymes are activated which cause the grains to sprout and become a living food. Our exclusive sprouting process not only significantly increases vitamins and minerals such as vitamin A, vitamin C, B-vitamins, calcium, iron, magnesium and potassium but also causes a natural change that allows the protein and carbohydrates to be assimilated by the body more efficiently. And even better still, our exclusive baking process preserves these valuable nutrients and retains the important natural fiber and bran. You can see, taste, and smell THE LIVE GRAIN DIFFERENCE™!, of Food For Life english muffins. As nutritious as they are delicious. 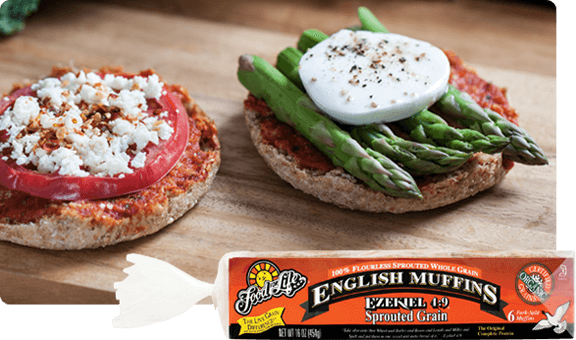 Food For Life sprouted grain english muffins are the substance of a meal - not just something that holds a sandwich together. See the difference fresh sprouts really make. Your body and taste buds will know the difference! With just one bite, you’ll know they’re a food for life! Organic Sprouted Wheat, Organic Sprouted Barley, Organic Sprouted Millet, Organic Malted Barley, Organic Sprouted Lentils, Organic Sprouted Soybeans, Organic Sprouted Spelt, Filtered Water, Fresh Yeast, Organic Wheat Gluten, Sea Salt.